Energy is the basic prerequisite for our strength and good health. We get energy from foods like vegetables, fruits, grains, and fluids like milk, juices, etc. Our body needs nutrients like vitamins, calcium, proteins, carbohydrates, and fats in required quantity to grow up. Busy schedule, fast foods, and low quality food, etc are the reasons that give rise to the risk of diseases, infections, and other vulnerabilities. So, it is necessary to intake quality food daily. So, prepare a weekly meal plan and keep vulnerabilities away. Download the given templates and plan a custom individual, family and Restaurant Menu sample weekly meal plan. 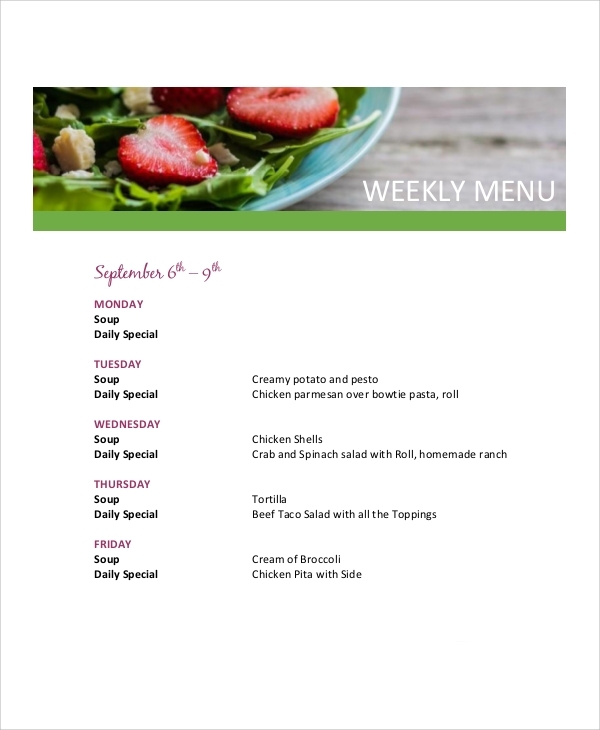 The basic weekly menu can be completely customized with the sample weekly template. Customize the template and prepare a custom weekly meal plan in minutes. It can be used by families, agencies, school staff, and other communities for preparing healthy meal plans. Weekly toddler menu sample PDF helps in caring for 1 to 3 year old kids. 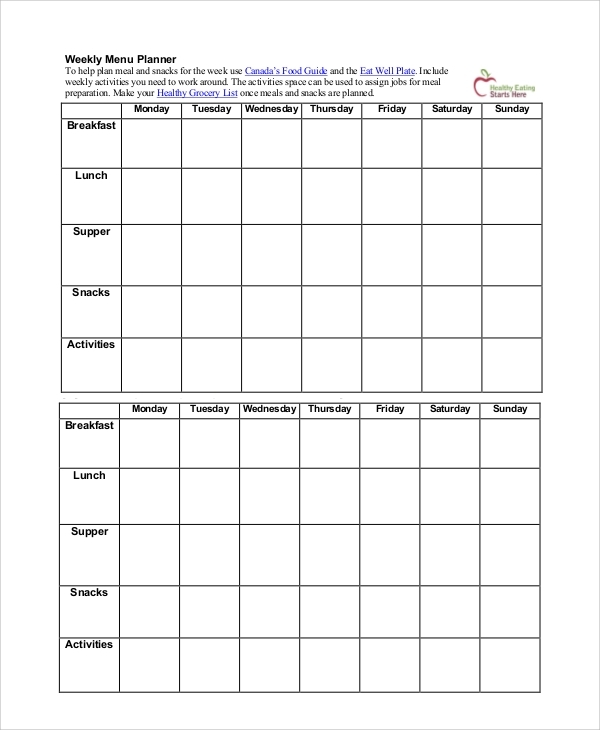 This template enables mothers to prepare a healthy weekly meal plan for their kids. 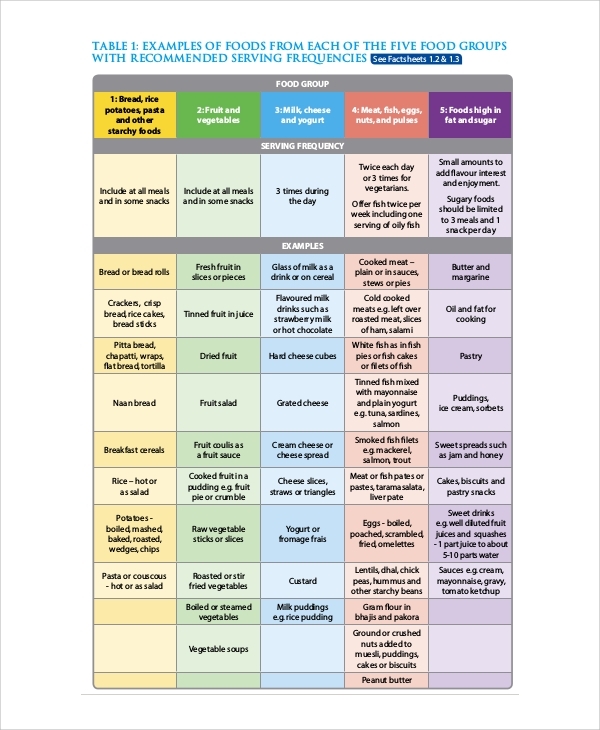 The template contains information on food groups, example, weekly breakfast, light meals, family meals, and snacks plans. Also, it includes a separate meal plan for vegetarian toddlers. 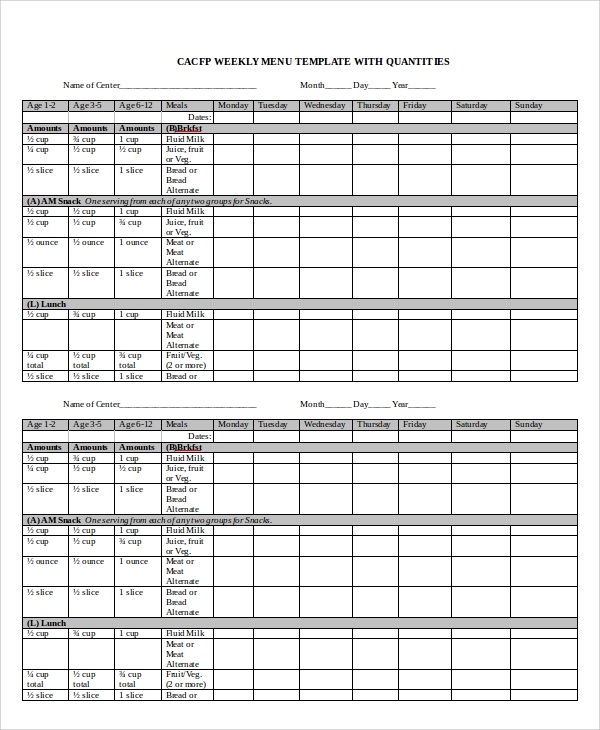 Weekly menu sample planner is quite beneficial stuff for both mothers and individuals. Take a print of PDF and prepare custom healthy eating plans. Add weekly food items lists for breakfast, lunch, dinner, supper, and snacks. 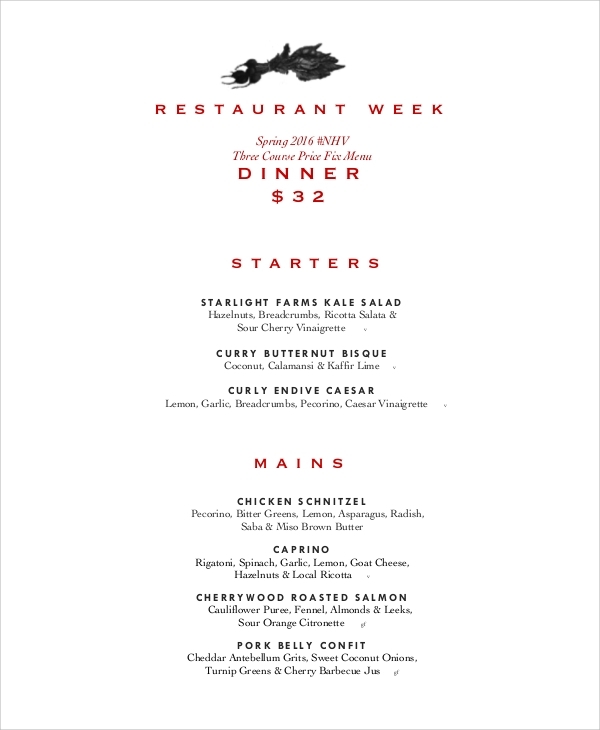 Plan a restaurant weekly menu using weekly dinner menu samples. 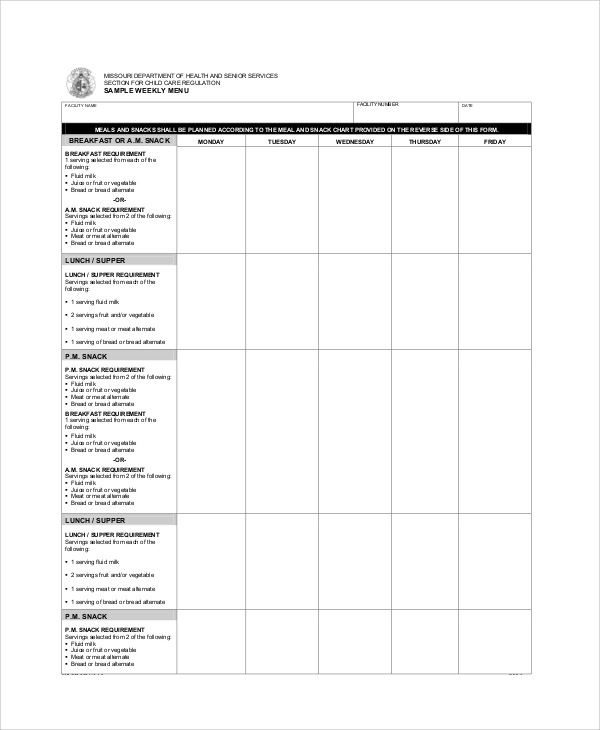 Download the template and use it as a reference for planning a custom weekly dinner menu list. Offer a wide range of starters, mains and sweets menu items for customers. 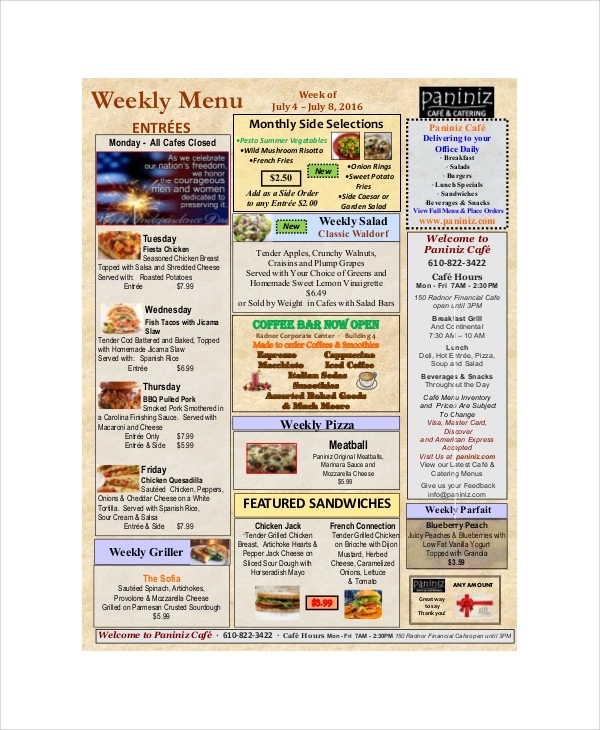 The weekly menu planner can be used by anyone in the world. Mothers can use it for making a family meal plan and the individual can use it as a personal weekly plan. You can organize your eating. Add high-nutritive foods in your diet plan. 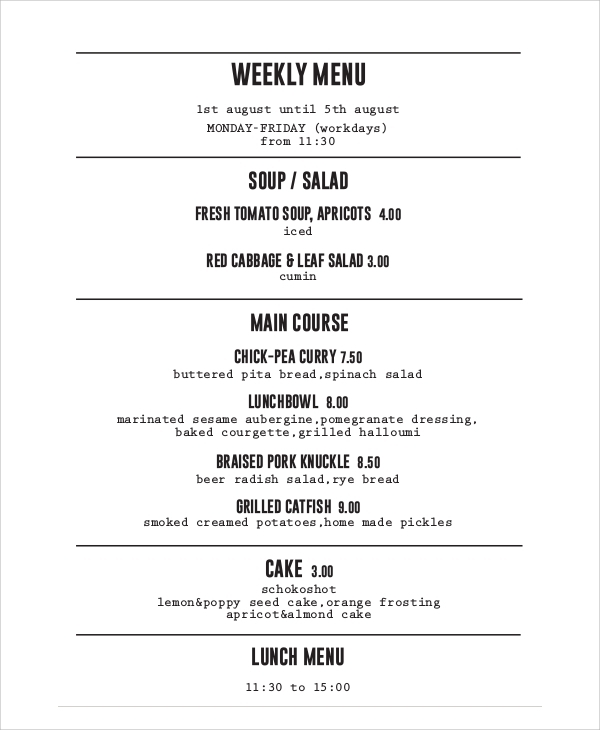 Weekly menu sample templates are easy to download and print. Take a printout and paste it to your wall. Follow your custom schedule and enjoy healthy life. An organized structure/schedule enables us to perform better than following an improper schedule. 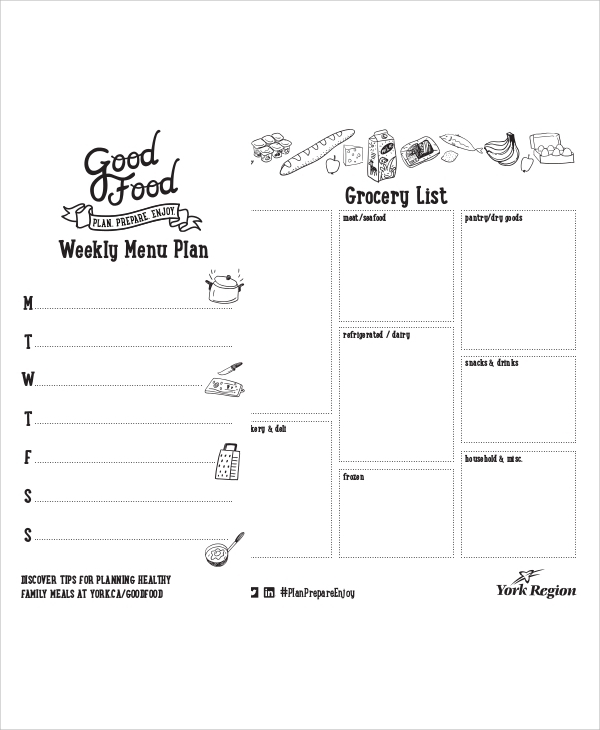 Do plan your weekly meal plans using our weekly Food Menu sample. Customize it and enjoy healthy eating. We always love to communicate with our visitors. Please drop your valuable feedback on our collection. You can also share your requirements with us and we will provide the best materials to help you.